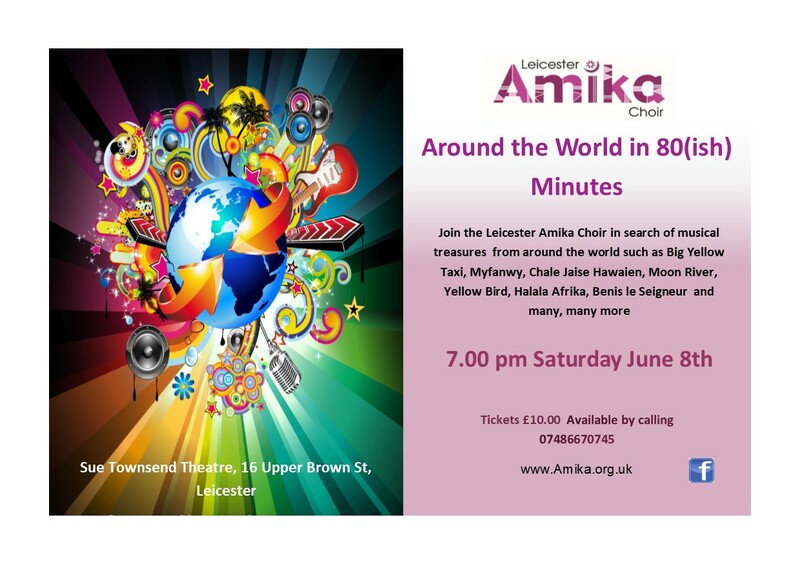 Amika is open to all comers - regardless of their singing experience or level of musical knowledge. All you need is lots of enthusiasm and the desire to sing! We meet for rehearsals weekly during school term time at either the Soar Valley Music Centre on Saturdays, or at the Secular Hall, 75 Humberstone Gate, Leicester on Friday evenings. In these rehearsal sessions you will be given instruction on singing technique and taught new songs by ear, no previous knowledge of music is necessary. Our musical director Una May Olomolaiye provides excellent teaching tracks from which you can learn if you want to catch up with the choir repertoire. A singing session with Una May is an experience in it's own right and not to be missed! A fee is charged for each rehearsal, payable in advance per half term of 6 weeks, £21 or £15 for low income concessions, or if necessary, weekly at a higher rate of £5.50 or £3.80 for low income concessions. If this creates a problem don't be afraid to ask for alternative arrangements with the choir committee. We aim to take part in two full concerts a year and in 2009 there were a number of shorter appearances including a set at DeMontfort Hall for the for the reception following the unveiling of the new statue of Ghandi in Belgrave and as part of the choir singing the opening song for the Special Olympics in Leicester. In 2012 we acted as backing choir for 4 of the songs in the Bob Marley Tribute "Catch as Fire" and in 2013 on 23rd November, we have again been invited to join "Festival of Choirs" at Curve. If you don't want to perform in public that's fine as well - the decision is yours.